There are many areas at home that can be hazardous for vulnerable family members such as kids and seniors. These are the bathrooms and restrooms. As their tiled flooring can easily be slippery when splashed with water, you have to provide safety measures to keep your family members totally safe while using them. Install these grab bars in strategic locations in the bathroom. Don’t put them too high or too low so that your aging loved one will not have to expend effort in holding on to them. Install them at just the ideal height from the floor. In addition, put them up near the doorway, inside the shower area, and near the toilet. This way, your senior loved one can steadfastly finish their tasks inside. Also, provide a textured finish to your grab bars so that your loved one’s hands won’t slip when this equipment is wet. When purchasing grab bars from a drugstore in Palm Harbor, Florida, ensure that you observe the physical requirements that are necessary for your specific bathroom. In order for your senior loved one to bathe themselves independently, make sure that your bathroom equipment can protect them from falls. 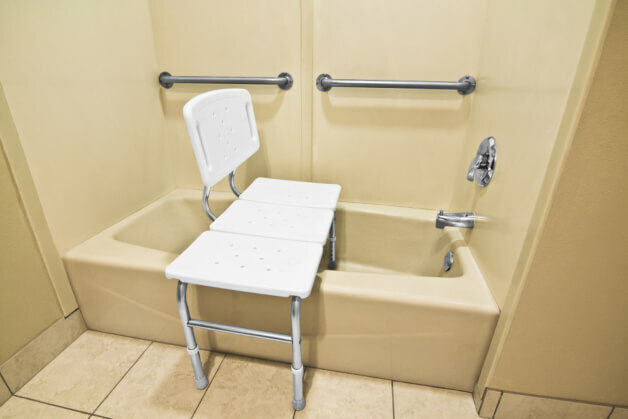 You can install a shower chair so that your loved one can just sit down while they’re bathing. This way, the chances of slipping are really minimal. If you also have bathtubs, ensure that you have hold bars for them to hold as rubber mats are properly situated on the floor. It will also help if you provide a hand-held shower so that your loved one can save the effort of standing up from turning on and off the shower knob. Along with that, see to it that there’s an easily reachable place to put bathing equipment such as towels or bathrobes. Some seniors will have difficulty in bending due to knee and joint problems. You can make it safer and easier for them to simply elevate the toilet seats. This way, they don’t have to bend too much when they need to use it. For another option, you can also install a toilet riser to also accommodate those who can’t use raised toilets. Additionally, put up arm rails beside the toilet so your aging loved one will have something to hold on to as they sit down or stand up. This keeps them steady and far from slipping incidents. As a Pharmacy in Palm Harbor Florida, we understand the high importance of ensuring the safety and overall wellbeing of your loved ones. When you need grab bars or other safety equipment at home, visit us at St. Mary Pharmacy. You can even call us ahead so that you can inquire about the availability of your medical or safety needs. SHARE this post with someone who needs pharmacy services in Florida. This entry was posted in Bathroom Safety and tagged drugstore, pharmacy, senior loved ones. Bookmark the permalink.